When alert() is used only a few times throughout a script’s execution, it is easy for the author to keep track of exactly what is being displayed in the dialog boxes. However, once nested loops and other advanced techniques such as recursion are introduced to the script, using alert() to debug your script can quickly degrade into wasting your time clicking an “OK” button as quickly as possible to dismiss unnecessary dialog boxes while hunting for the one box that you’re interested in. The complexity and overhead of using a debugger isn’t unique to Venkman; nearly every IDE (Integrated Development Environment) includes some sort of debugger, but these are often ignored by developers due to the amount of effort that must be expended to actually use the debugger and step through their code. Another, simpler debugging method has come into fashion in recent years, although the principle behind it must be as old as the art of programming itself. This method is called logging, and it works by echoing as much information to the screen as is necessary to find out how your code and data structures are behaving. The echoed information can include everything from descriptive statements that are used to let the programmer know what is happening in the script to the value of a variable or the field of an object; it can be any information that will inform the author of what is happening in the code. Whereas logging packages in the languages listed above provide a complex class/package structure built on top of inheritance and other object-oriented concepts, fvlogger borrows concepts from Log4J and its cousins, but eschews their complexity by providing a simple API and offloading the heavy lifting onto the DOM. One of the fundamental ideas behind logging is the ability to set the granularity of what information will be logged: Should only errors be displayed? What about information to indicate which branches and/or loops are being executed? 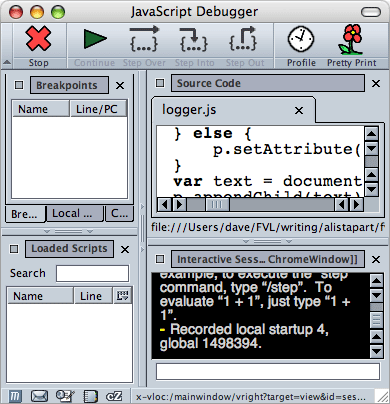 While it is possible to get away with only using one function to log messages to the browser, by using all four you will be able to filter your log messages based on their importance; debug messages are the least critical and can often be dismissed, while error messages are the most important and should always be taken into consideration. By default, all messages will be appended to the element whose id is “fvlogger” (although this can easily be changed). The log messages are wrapped in <p> elements—which, like the id, can be changed—and have a single class applied to them that corresponds to the logging function that was used to create it. Debug messages will have the debug class applied to them, error messages will have the error class applied to them, et cetera. These classes allow you to style your log messages any way you like using CSS; the project includes a default stylesheet and supporting images to get you started but you are, of course, free to change its appearance to your heart’s content. eraseLog() will erase all messages from the log. That being said, let’s take a look at the steps required to set up fvlogger. The following snippet of XHTML defines the elements that will be used to interact with fvlogger, although we could get a way with just a simple <div> if we really wanted to. You will notice that none of the log messages in the <div> below are shown; this is because the messages are created dynamically by fvlogger and apppended to the document after it was loaded into the browser. …if you don’t require all the bells and whistles. As for the log messages themselves, the following code snippet illustrates how to create log messages and outlines which level of severity should be used for your log messages. Now you’re probably asking what that other gunk in the log is. Those are the log messages generated by code included later in the article. Which brings me to the second half of the article. Now that you’re familiar with the theory and practice behind developing with fvlogger, I’ll walk through a real-life example—one that I came across in the development of the package—of the way logging can aid in debugging your scripts. So, theoretically, any elements in the document whose class is “labrat”—whether they be a part of the document when the page is loaded into the browser or appended at some point thereafter—should appear in bold-faced red type, including the following two examples. Easy-peasy, right? Almost, but not quite. The examples shown above are included in the document (ie: they were created when authoring the rest of this page), so it should come as no surprise that they appear as they should in every browser that supports CSS. However, with the cross-browser support of the DOM, dynamically creating elements and appending them to the document has become commonplace—even required—by many websites and applications, this article being one of them. Let’s make sure that we can apply classes to these dynamic elements as well. The above snippet of code works in all modern browser families—WebKit, Gecko, and Opera—except for IE. With Internet Explorer, the following paragraph will have the same font as all regular paragraphs, even though it has the “labrat” class applied (go ahead and load this page in IE and another browser and compare the differences). However, Internet Explorer is “special” in the way that it creates elements. Instead of having zero attributes (as one would expect) immediately after creation, new elements inherit all attributes and their default values as defined in Internet Explorer’s default DTD. So instead of our new element having a single attribute after setting its class, it actually has 84. Zoinks! But what’s equally as odd is that when attempting to set the class of a new element through its setAttribute() method, IE will actually create another attribute node instead of replacing the value of the existing class attribute. Thus, we end up with two class attributes instead of one in IE (attributes #3 and #83 in the log statements shown above). "And guess what. It works!" In my experience, yes — setting the “className” property of a DOM node will apply the class to the node in question in all modern browsers I’ve tried. IE won’t actually register this event to the object. To my surprise, Firefox will actually do this. So what I’m trying to say, that setAttribute in IE won’t do you any good with attributes like ‘class’, ‘style’, ‘maxlength’, ‘value’, etc.. Using setAttribute and getAttribute for your own custom attributes works perfectly on the latest browsers..
Nice work! I’ll use it for sure. But there’s one improvement I’d make. I would add “return false;” to every onclick event in the menu to avoid annoying page leaping. However, related to that awkward setAttribute loop, is object.className now a deprecated property? Agreed, this is very clever. More importantly (now that it’s here), it’s available to those doing coding that are experiencing more cross-browser issues as the Ajax approach is becoming more common. This would have been a lifesaver on a project I completed recently, and my company hesitant about Ajax due to concerns about difficulties in maintenance and debugging. Let’s not forget the Venkman plugin for firefox (http://tinyurl.com/cmu7j). It’s easy to use and works well. The implementation’s good though. I’d fallen into the habbit of using .className, which seems to work, but isn’t part of the DOM spec. The approach in the article is more pure. I’m glad the article is being well-received; I’ve been using the code in several projects myself and have found it to be a pretty invaluable tool. Keep the thoughts/comments/improvements/suggestions/etc. coming; the more topics such as this one are discussed the better we will all be for it. As for the code itself… Yeah, there are a few different ways to deal with browsers and how they handle attributes and their values. Looping through the list of attributes and doing an exhaustive name comparison is by no means the most efficient (or elegant) method of finding the class name, but it does get the job done. Like most topics related to scripting browsers, it’s a matter of finding a balance between what works in every browser, what *should* work in every browser, and maintaining your sanity while cobbling together whatever hack you can come up with. The values of all the node’s attributes are being echoed to the debug log merely to illustrate the difference between how Internet Explorer and every other browser handles node attributes. Sorry for the confusion. Then relaunch safari, and from the debug menu you can open a js console. I myself tend to create an extra DIV on the page, style it with position:absolute; and fill its innerHTML with various debugging values. It’s a step up from the alert() in that it does not halt the script (allowing time-bugs to expose themselves) and does not require lots of clicks in case your bug is inside a loop. The downside is of course the numerous bugbox.innerHTML = ‘such and such’; spread across the script, which need cleaning up after bugs have been zapped. It’s always served me well, but maybe I’ll try ouy fvlogger. See if the glove fits. I think that should be a default, instead of a carefully hidden option. But then again, the JS engine of Safari does not behave strangely compared to the Gecko engine, at least not for my scripts. A Bbg fixed in Gecko equals a bug fixed in Safari. However, in my experience, Internet Explorer does not seem to "like" self-closing script tags and fails to load the script. Can anyone else confirm this or provide any additional information on the topic? Perhaps the article example should be corrected to use a closing script tag. The line needs the onclick to show the Info blocks. I believe it would be beneficial to add onkeypress=”?showInfo();” to those links, for keyboard users. Logging is powerful for tracking down problems you *didn’t* expect to happen, assuming logging is occuring in the right places and there’s a way to get at the log output. A nice feature for fvlogger would be “crash report” submission UI so users could report failures back to the site maintainer. When you know a problem exists interactive debuggers are often more efficient than trial-and-error logging, and are worth the effort spent learning thier quirks. Plus, you get to skip the frustrating “trial-and-error” step. 1) Date/Timestamps prefixing each log, – auto generated. 2) A global switch to turn logging on and off. All up, – very sweet! Nice article. Nice stuff. I have already started using it and find it quite useful. ALA, Keep such article coming. ALA has saved me so much time with such high class material. I very much enjoyed this article, but I found the statement “__The concept of logging was popularized by Apache’s Log4J package for Java__” curious. I have heard of log4j but I was not aware that it has popularized the field of logging – is that to suggest that prior to log4j, logging was uncommonly used? Perhaps it depends what field you are in, but in UNIX we’ve enjoyed the syslog daemon (syslogd) for quite some time, and logging is standard practise in most applications. 1. Putting very simple function names like “show” and “hide” in the top-level namespace is bound to cause problems. I’m working on a web app that already has these functions defined, and adding the logger will override them. I had to change all the fvlogger functions to have a “fvl_” prefix to them. I know Venkman has a cool Profile feature which I’ve used manually and which allows you to log data about which javascipt functions are being called and the min/max/avg process times per function. Is there any way to automate this in Venkman ? Is anyone aware of another tool that would do this ? The Dashboard widget API already has a great console logger built in. In fact, all alert()s go straight to the console. This works well: if you forget to remove your logging code before release users won’t be pestered by pop-up windows or other unsightly logging messages. // This is the div that contains each image and it’s browse box. // This is the image! I have gone through some articles here and tried some other ways of doing this and IE just won’t play nice. Any direction would be appreciated. I would then appendChild to the divname and – no CSS rendering. It was helpful to have this discussion available – thanks. We’ve had Flash debuggers inside Flash before… but at runtime they can’t really handle the volume of debug info that can come out. Hell, even the Flash IDE has the poorest output log ever. fvlogger was easy to get working. Keep the great work going. The tips are really helpful, as are some of the discussions. Learnt a lot. Thank you.